Perhaps so, as we watch Vladimir Putin move into Ukraine militarily on a similar time frame. Hitler showcased his newer, brighter, more modern and friendly Germany in the 1936 Olympics, catching both the eye and the approval of the world in spectacular fashion. 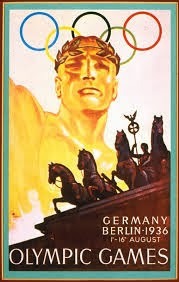 His was the first televised games and filmmaker Leni Riefenstahl, a Hitler favorite, put together a $7 million extravaganza titled Olympia, an enormous sum in the middle of the Depression. Putin has just closed the most expensive Winter Olympics ever staged, to similar worldwide acclaim. Behind the curtain of the Olympic flag, Hitler was demanding ‘autonomy’ for the 3 ½ million Germans ‘oppressed’ in bordering Czechoslovakia. He got his way from British Prime Minister Neville Chamberlain in Munich and the Czech Sudetenland was absorbed by Germany within six weeks of the closing Olympic ceremony. Thus was Peace in Our Time announced to the world, followed by a full-on invasion of Czechoslovakia, then Poland and, finally World War II. The Olympic-invasion metaphor today is in Ukraine, another quarrel in a far-away country between people of whom we know nothing. The comparison is spot-on, a nation ‘annexed’ by Russia in 1939 and becoming newly independent in 1990, shortly after the wheels came off the Soviet Union in 1989. Ukraine is a democratic republic of 45 million people, an independent nation the size of Texas, with nearly twice its population. Adding to the confusion, but reinforcing the similarity, the current flap is over the Crimea and the Crimea bears a resemblance to the Czechoslovak Sudetenland. Crimea is a small Ukrainian peninsula, hanging off the bottom of the country and dipping into the Black Sea, a major point of access for Russian shipping and their Black Sea Fleet. This is no small deal and the stakes are high enough for the world to pay attention. The present circumstance has to do with Ukraine’s desire to move toward and eventually join the European Union, a move that horrifies Putin, who is trying to regain rather than lose what is left of the old Soviet Union. Kiev, Ukraine’s Capital, erupted in flames and enraged its citizenry when Viktor Yanukovych (elected President in 2010) suddenly reversed Ukraine’s steady and popular move toward Europe, opting to accept a $15 billion offer of economic aid from Russia—presumably in return for turning away from the European Union. Putin says there were no conditions to the aid package, but the dog was on the hunt. Streets aflame and casualties mounting, Yanukovych attempted concessions. Prime Minister Mykola Azarov quickly said "I affirm with full authority that the negotiating process over the Association Agreement is continuing, and the work on moving our country closer to European standards is not stopping for a single day." But the citizenry was having none of it and two months later Yanukovych abruptly fled his office, showing up briefly in Eastern Russian-speaking Ukraine to make a brave statement of still remaining constitutional president of the country, then leaving for the friendlier confines of Russia. Putin’s troops—now on the streets of Crimea and likely as I write this expanding into Eastern Ukraine—are the result of a plea from that exiled president to protect Russian lives and interests, specifically his life and his interest, although Putin had very much his own interests at stake as well. Echoes of the Czechoslovak Sudetenland. American President Barack Obama has told Putin there will be repercussions and a price to be paid if troops are not withdrawn. The European Union and United Nations are less forceful, but apparently unified in their criticism and China has yet to weigh in. Yet this incursion comes on the heels of the recently closed Sochi Winter Olympics. One huge difference in the circumstances is that neither the West nor Russia is either apt or willing to escalate this present situation into another broad war. The days of major wars between world powers are likely gone, but the time of minor conflicts with major players behind them is upon us and very much in the forefront of modern history.